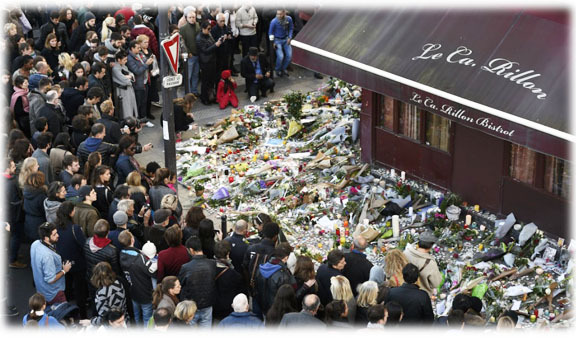 Because of the recent attacks in Paris Take 2 With Jerry and Debbie will be doing a special show on Monday. 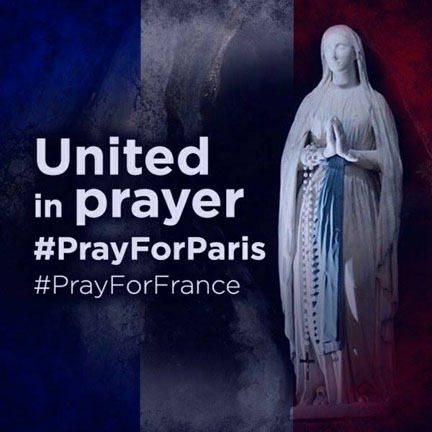 We pray for the victims of the terror attacks in Paris. But how do we wrap our minds around such senseless hatred and violence? Most important, how do we talk to our youth about what happened in France? What should our reaction be when we hear of this kind of violence. Please join Take 2 With Jerry and Debbie today at 12pm ET. Regarding your program today…this past Sunday our pastor reminded us to not fear death. What is important is that we are living our faith. If we are living it then we have nothing to fear. By the way, he is an exorcist for our diocese. We are fortunate to have two very holy priests. God bless all you do. …“My serious words to you may not have sounded as hopeful as I meant them, so I am writing to complete my message of encouragement to you and all holy priests who put their lives on the line to offer the Lord’s Sacrifice, to bless, to confess and teach His beloved flock. Regarding your wonderful homily which started my thought process, you have correctly identified that a huge problem in our current culture is that the average person hoards what they perceive they will need someday or in an emergency, leaving no opening for God to prove He is trustworthy. They also preoccupy with toys etc., compounding the problem. NG! I am humbly asking everyone I meet, to do some teaching in our parishes that will start driving home the message about what TO DO in an emergency. (The message is always the same but this would be a good time to teach it again.) We MUST NOT feel terror but must automatically kick into gear our mental and spiritual preparedness and the knowledge that God is near and is trustworthy and ‘it is always darkest before the dawn’. Now is a good time for the flock to learn to pray and listen -to know each step our Lord asks us to take during a chaotic event. He will be asking us to share –one hand not knowing what the other hand is doing. He will ask us to protect the innocent from marauders. He will ask us to acknowledge Him in every situation. He will ask us to be a sign of Hope to everyone we meet. When God does lovingly send us a Divine storm, His people should already be prepared for it from the pulpit, knowing that they will be part of the Divine rescue– the resurrection, the period of peace. God always grants a good to come from evil. Our Hope will be His light in the darkness. Thanks for reading this Rev. Father Peter. God bless –Praise God!! The daily readings for today seem to touch on this. Secularism is a big problem. We need to evangalize.